Thank god for the College Football Playoff. The Ducks would have been left out of the national championship if the BCS system was still being used; the same goes for Ohio State. In the first year of the playoff, it has already been proven that the BCS was a faulty system. Next thing you know, the playoff is going to expand to eight teams, then 16, then 64! Ok, maybe not 64, that would be a little unrealistic. Anyway … WE’RE GOING TO DALLAS!!!!! I’m lucky enough to get to go to the game, and I hope I see tens of thousands of Duck fans there. I don’t know about you, but I confess that I certainly was one of the many doubters of Ohio State. I mean, who wins their conference championship game and a playoff game, against Nick Saban and Alabama no less, without their starting quarterback AND second string quarterback. A third string quarterback has put up a total of 101 points in his first two starts. That is just insane. I guess there’s a reason the nickname of that (former) third string quarterback and now OSU starter with No. 12 on his jersey — Cardale Jones — is “12 Gauge”. If Urban Meyer, the Ohio State head coach, was not one of the best coaches in college football, and possibly of all time, he definitely is now. Not many coaches can lose a Heisman favorite before the season even starts and then make his backup into a Heisman candidate, to only lose him as well, and to finally make it to the National Championship Game with a third string quarterback. Credit has to be given where it’s due. So, clearly, Meyer has some “secret formula” that wills his team to victory no matter what. Ohio State runs an offense that is nearly identical to Oregon’s, which makes this game that much more intriguing. No excuses, such as, “Oh, they just matched up well against us” or “They run an offense we haven’t seen.” So, how do you gameplan better and execute more effectively? You closely analyze Ohio State’s favorite plays. As you can see in the screenshot above, the Buckeyes are lined up in a familiar shotgun set with three receivers, a tight end, and a running back. What do you think they’ll run out of this formation? Read option, you might surmise? Exactly … it’s going to be a read option. There are three key blocks that need to be made in order to make this play work. At the snap, you’ll see the left guard pull as he and the tight end, who is lined up on the left side of the line as well, will double team the defensive end and block him out. Next to the left guard is the left tackle. The left tackle is going to make a seal block, which does what you would think it does — seal off the hole for the running back. His seal block will be made on the defensive tackle. What looks like a small hole is actually a very large one for Elliot. A couple of short seconds into the play, the receiver wide left is going to make a crack block, as you can see above. A crack block is when a receiver or any other offensive player is split wide and instead of blocking the man in front of him, the player cuts inside and block a linebacker back towards the middle of the field. This block can be extremely effective since, if the defense doesn’t call out “crack”, the linebacker is going to have no idea the block is coming and is going to get blind-sided. This particularly effective block by the receiver is going to take out two Alabama linebackers! This 85 yard touchdown sealed the deal against Bama — let’s hope this doesn’t happen against us. As the quarterback reads the defensive end, he decides to give it to the running back. The running back is going to find the hole and cut it upfield, using his blazing speed to blow by defenders for a game-winning 85-yard touchdown. The hole might not look like much, but if you were to get a bird’s eye view of it, you would see that there’s actually a decently large hole to run through. This next play is based more on a concept OSU likes to use. The concept is used when defenses run zone against them. This route running concept is used to exploit the open spaces in the zone. The receivers are each going to have their specific routes to run, but since it is zone, there’s going to be an open space or two. If a receiver runs into an open space, he is going to “sit down” (that is, stop the route and turn to face the QB) instead of finishing the route. In the screenshot above you can see that OSU is lined up with four receivers. The receivers are each going to run their routes, but as I mentioned, that’s not the focus of this play. The focus is on what they do with those routes. The receiver and quarterback are going to be looking for a “soft spot” in the zone. At the snap, the receiver wide right is going to be running a post route. He is going to get to around 10 yards downfield and realize that there is a hole in the zone, so he is going to “sit” and wait for the quarterback to find him. This concept can be very effective when the quarterback and receiver are on the same page. This concept requires that the quarterback and receivers be on the same page, because if the receiver doesn’t see the same hole the quarterback does, or thinks he should be stopping somewhere else, there’s a good chance the quarterback is going to throw an interception. In the case of Ohio State, the receivers and quarterback are on the same page, which makes for a deadly weapon that the Ducks need to watch out for. The OSU defense has playmakers, like Bosa, who can make a difference at any point. Now, let’s move on to the OSU defense. The Buckeye defense is feisty, with a lot of playmakers, so although they give up yards, they make stops when needed. To begin, let’s take a look at a play from the Buckeyes’ only loss this season, their game against Virginia Tech back in week two. 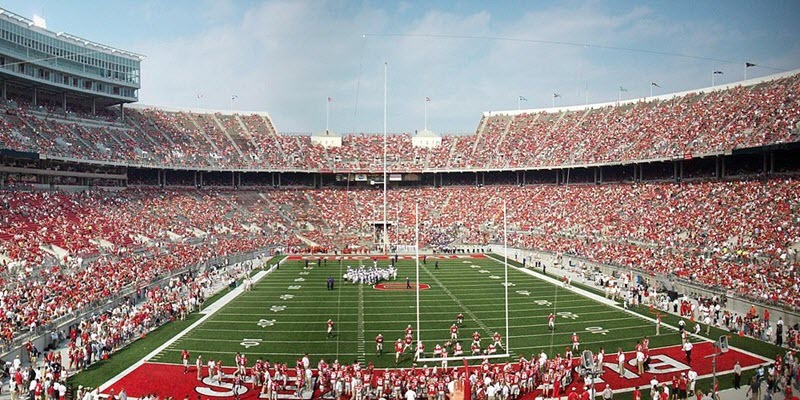 As you can see above, the Buckeyes are lined up in a 4-2-5 defense. The defense clogged up all of the running back’s holes. Starting with the left side of the defensive line, OSU’s left defensive end is stud sophomore lineman, Joey Bosa (No. 97). Bosa can wreak havoc, as you can see for yourself in this play. Bosa blows up the tight end and right offensive tackle with a bull rush. The two defensive tackles are going to rush the two gaps that are in front of them. The right defensive end is going to be the read man and is going to cover the quarterback. We can’t let OSU’s defense make plays like this on Monday. Now, you will notice that the two linebackers are covering the running back and leave the quarterback to be covered by just the defensive end. This is probably going to have to change. I think it would be foolish for the Buckeyes to not leave at least one other linebacker to cover Mariota because there’s no way a defensive end can cover Mariota. The play of OSU’s defensive line can dictate how the game turns out. The Buckeye offense is nearly a mirror image of Oregon’s, so our Ducks’ defense should be ready. There is one problem though. The Buckeyes have two elite playmakers in running back Ezekiel Elliot (No. 15) and wide receiver Devin Smith (No. 9), each of whom can break out for the big play at any moment. Smith has 14 receptions of 20+ yards, 9 of which went for TDs (leading the FBS in both of those big-play categories); he also has 30 touchdowns on his career, with an average of 37.9 yards per touchdown. Then, there’s Elliot, who has 1,632 yards on the year on only 237 carries with 14 touchdowns. That’s what you call big play ability! Let’s not forget Smith’s 47-yard touchdown and Elliot’s 85-yard game-winning touchdown in last week’s semifinal. The big play needs to be contained. This is the culmination of what could be the best season in Oregon Duck Football history. This very well may also be the best Duck team in the program’s history. The last hurdle, though, is a big one. Ohio State has found a way to overcome any and all obstacles and continue to win games. You can bet they are going to be pumped and ready to play. Despite the fact that Oregon is 0-8 all-time versus Ohio State, I think that Mariota has the “it” factor, and will have his team in the right state of mind, ultimately leading to a 52-41 Duck victory and celebrating throughout the streets of Eugene!!!!! !